Jury duty, a great way for the government to save money. The only people who like it are those who are unemployed or retired. Are you getting a jury of your peers? Nope, you're getting people who couldn't find a good excuse and are now pissed at you and the system. Jury duty is unfair to both the jurors and to the defendant. 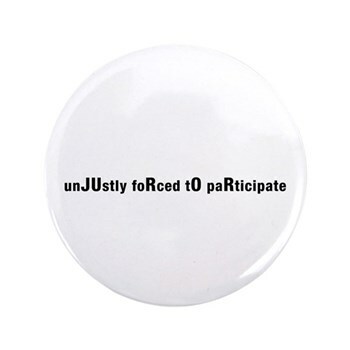 Show your disdain for the system with these buttons, t-shirts, tote bags, and now, water bottles. i hate jury duty as well. I got lucky with mine. 2 days, 2 hours each day, $80. although I actually wanted to be called to jury duty to be able to experience it. Unfortunately, I got called but then they sent me back, so I didn't get to be on a jury, although I did get 40 dollars for nothing. It's $40 for nothing when you got nothing better to do. When you have a job, it's a loss of at least $100. I like! Though I didn't do jury duty since as I told the judge "I'd rather not fail my math class..."
Personally I don't know why people complain about jury duty. While I have never had it I am looking forward to it. If they put you on an interesting trial why not? I think it would be fun and you get some cash out of it! I always like free cash! Same reply to you as to babysitter. It's free cash if you're not working. If you're working, just showing up is a loss of money, getting picked is a loss of a lot of money. I see what you mean about losing out money when you work, but for someone who doesn't have a job this is basically free cash! So how do you propose the judicial system should work? Educated, paid people who are not pissed off to be there.